Saudi oil price policy has been much in the news lately. Why did the Kingdom decide to hold production levels and allow oil prices to crater? Why didn’t Saudi Arabia move to protect oil prices by reducing its production? A number of reasons have been postulated, including a few conspiracy theories: For example, some suspect that the Saudis and the US want to pressure the Iranians and the Russians; or that the Saudis want to pressure US shale producers; and that the Saudis want to maintain market share as the Libyans re-enter the market. Certainly, recent political events provide plenty of opportunity for side deals. The US does want to pressure the Russians and Iranians, and US involvement is necessary for a coordinated effort to counter the threat of ISIS in Iraq and Syria. If oil prices are determined in smoked-filled back rooms, then certainly the motive and opportunity have been present. The Saudis and the Americans have an incentive to cooperate. On the other hand, Saudi actions are also consistent with the Kingdom’s long term strategic interests. To understand Saudi Arabia’s view of oil supply cuts, it is necessary to revisit the lessons of 1979. That year saw the Iranian Revolution, followed by the Iran-Iraq war in 1980. These disrupted oil markets, and prompted OPEC to decide on a high oil price policy. After 1980, high oil prices were maintained principally by Saudi Arabia cutting production. However, these production cuts and resulting high prices prompted a market reaction. Global oil consumption fell by 6 mbpd and supply grew by 7 mbpd over the next five years. Each year, demand fell and supply grew. To maintain prices, the Kingdom was forced into successive rounds of production cuts. Whereas Saudi Arabia was producing almost 10 mbpd in 1980, by 1985 production had fallen to a mere 3.4 mbpd, a drop of two-thirds in just five years. Had Saudi Arabia stuck with its high price policy for another two years, it would have exited the oil business entirely. Faced with this prospect, the Kingdom and OPEC threw in the towel in 1985, and oil prices collapsed. Saudi Arabia would gradually claw back production levels to 8 mbpd by 1991, but the Kingdom did not re-visit 1980 production levels until 2005. For the Kingdom, the legacy of 1979 was one of policy failure and dire economic consequences. GDP fell by 20% and would not return to 1980 levels until 1991. The per capita impact was even more dramatic. In 1980, per capita GDP in Saudi Arabia stood at $54,500, compared to a lowly $28,300 in the US (both measured in 2009 dollars). Per capita, Saudi Arabia had nearly twice the income of the United States, and the US at the time was the unquestioned leader in advanced country income. Those were to go-go days of the petrodollar. This world came crashing down in the wake of 1979. Although prices were kept high through 1983, Saudi GDP was falling after 1980 due to oil production cuts. Unit prices remained high, but volumes were declining precipitously. In 1985, insult added to injury, as Saudi was hit by both dramatically reduced production and collapsing prices. By 1987, Saudi per capita GDP has fallen to $31,000, a decline of 43% in just seven years. And this did not improve until the run up in oil prices started just a decade ago. 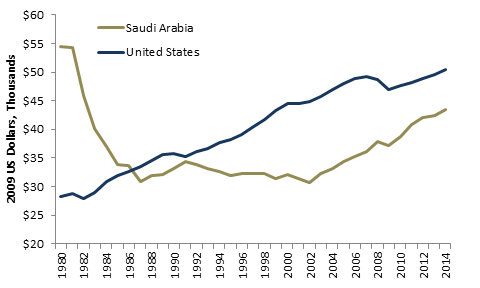 Even today, Saudi per capita GDP remains 20% below its 1980 level in constant dollar terms (in part because the Kingdom’s population has more than tripled since 1980). For Saudi Arabia, 1979 left a lasting impression. While the Kingdom can compensate for unexpected supply outages or transient declines in demand, in the long run, markets cannot be defeated. Reducing production to maintain prices just invites reduced consumption and increased production from competitors. These forces will in turn reduce prices again, requiring yet another round of production cuts. History tells the Saudis that such a policy will end in disaster. For the Kingdom, 2014 looks much like 1979. And the lessons of 1979 dictate that, at the end of the day, Saudi Arabia is better served in the longer term by choosing a production level and sticking with it. And that’s just what the Kingdom has done.